Irish boxer Katie Taylor, favorite to win gold at the London Olympics. Katie Taylor is Ireland's best hope for a gold medal at the Olympic Games, which take place in London two months from now. I hope she wins her gold medal, but I won't be tuning in to watch her. Taylor is a boxer and, although this possibly puts me at odds with 'modernity,' I will not watch women's boxing. From everything I've picked up through the television, radio and newspapers Taylor is a fantastic boxer, extremely skilled in the "manly art of self defense" and is favorite to win gold. This past weekend she won the gold at the World Championships, a title she has held since 2006. 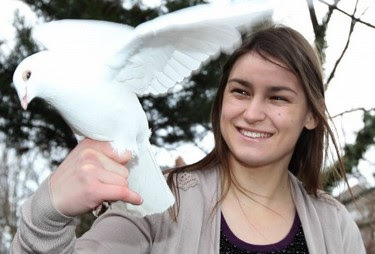 Of course women's boxing is a minor sport, unlikely to create much of a stir in most countries, but in Ireland Katie Taylor is on the verge of becoming a superstar. Public misgivings about women's boxing are non-existent either because people are afraid of falling afoul of the PC police or they're too desperate to see the Irish flag fly above all others as the Irish anthem rings out at this summer's games. Irish Olympic gold medals are pretty rare, especially if you exclude Michelle Smith's three golds for swimming in Atlanta in 1996. Why on Earth is London hosting the Olympic Games? Undoubtedly Taylor's undamaged face and perfect smile owe a lot to her skills in the ring. My wife met her once and was surprised at how pretty Taylor is. An attractive woman boxer seems unlikely, but there you go. I'm sure this fact is not lost on marketing people, who are probably drooling at the ways Taylor can be put to work once she wins that gold this summer. The people in charge of women's boxing have probably noticed too. I wouldn't be the least surprised to learn that it was Taylor that they had in mind when they "suggested" that women boxers wear skirts in the ring rather than shorts. Maybe they didn't know Taylor well enough before making the suggestion. The new sport's biggest star was having none of it. She said the miniskirts they wanted the women to wear were a "disgrace," that she didn't "wear miniskirts on a night out, so I definitely won't be wearing miniskirts in the ring." Taylor is a female boxer, which is rare enough, but she is also a born again Christian and unafraid to talk about her faith. Among young Irish people that makes her even rarer than a female boxer. American sports fans are used to athletes making reference to God in interviews, but here that sort of overt religiosity is unknown. Taylor is more Jeremy Lin than Tim Tebow, but regardless I'm sure the Irish media is hoping she keeps those "glory of God" references to a minimum. It invites awkwards silences from interviewers. My wife may have been surprised by Taylor's appearance, but it was Taylor the person that really got her. Taylor is "humble, friendly, polite, and extremely generous," a real credit to her parents and she'll be a great ambassador for Irish athletes when she wins that gold. From all I've learned about Taylor I admire her greatly. I really wish her well. It's just that she's only a few years older than my oldest daughter and, although I'd have loved it if my daughter were great at running or soccer or basketball, I would never have wanted her to box. I expect to watch a fair amount of this summer's Games, but I won't watch women's boxing even when our local hero goes for gold.